maintenance make it a real winner. 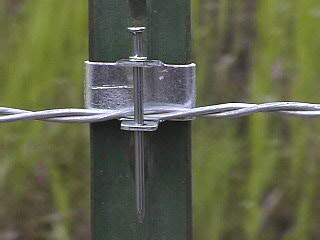 or tie-wire (on steel posts) to stretch conventional fences. spring with a lot less hassle, maintenance, repair and ease of stretching. and give you time for other farming responsibilities or leisure time. and are easier to install again saving money and time. the tie-wire method and in most cases the wire will break before the clip. 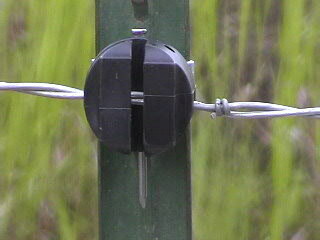 We have found that the wire will break or the T-Post will bend before the clip will fail. 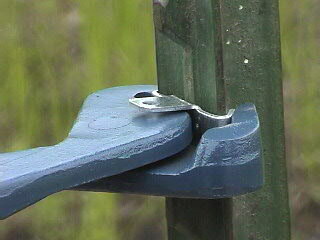 Many times an occasional straightening of the clip is all that is required if bent. If it does get damaged, replacement is a snap! feature wire breakage is reduced because the wire has the whole length to move and stretch if necessary. Where the tie-wire method limits the movement allowed and breaks are more frequent. Super -Heavy Insulator for all types of electric fencing needs.